Private Schools - Handling Professional Enquiries: Are You Failing At The Follow Up? Across the UK, a huge percentage of private schools are failing to retain the interest of potential clients for one simple and easily amendable reason: neglecting the ‘follow-up’. Failing to ‘follow-up’ on an enquiry or visit means that your school is bypassing a vital ‘conversion window’, during which clients are most amenable to negotiation, and therefore more likely to be converted from a potential client into the parent of one of your students. Ignoring the client in this window could be perceived as a lack of interest and more crucially, an indifference towards the individual needs of the client and his or her child. So, what is the ‘follow-up’ rule, and where are you going wrong? insight6 partners a number of independent schools, sending a team of our Researchers to assess the standards of customer service. Looking at a sample of reviews from schools prior to working with insight6 there was a lack of aftercare for potential clients, which may well have contributed to their disinclination to pursue business with the school. Once an initial enquiry has been made, it is vital that the client be contacted shortly afterward to resolve any outstanding concerns, and to lay the first stepping-stones towards securing their business. If a client is left to pursue the school of their own accord, your school risks their interest waning, or shifting towards other establishments with better customer service structures in place; there will be plenty of competitors poised to take the initiative where you did not. A ‘follow-up’ conversation is paramount to retaining your potential client’s attention, and should be thought of as part of the natural flow between handling a preliminary enquiry and enrolling a new student. To ensure a successful school-client ‘courtship’, the ‘follow-up’ should be implemented in two stages: after the client’s initial enquiry, and then after their visit to the school. According to our Customer Experience Reviews (CX Reviews), the treatment received during these stages was lacking in a variety of ways, but most significantly during the immediate aftermath of correspondence. Whilst school’s often put effort into strengthening their front of house department to ensure that preliminary enquiries are handled with professionalism, it is crucial to note that a high standard of customer service needs to extend beyond a cheerful greeting and a pleasant phone attitude, and into the ‘follow-up’ phase. A primary interaction with a possible client does not stop once the web or phone enquiry has ended. The ‘follow-up’ should be thought of as an additional step to this interaction, and a vital part of it. By implementing a set waiting period of 3 – 5 days, after which a ‘follow-up’ will be made if the client has not gotten back in touch, your school will stand out amongst others, and increase your prospects of gaining the client’s trust. 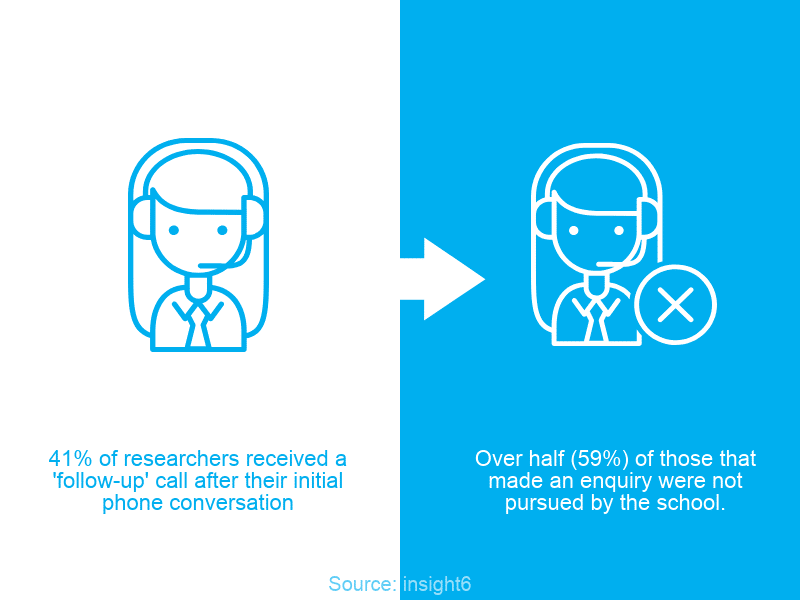 According to the sample insight6 looked at, only 41% of potential clients received a ‘follow-up’ call after their initial phone conversation, prior to working with insight6, meaning that over half (59%) of those that make an enquiry are not pursued by the school, despite indications that they may want to book a visit or learn more about what the school has to offer. Without a clear indication that their custom is wanted, clients may feel that their child is not being given precedence, which can be a deterrent from further attempts to form a relationship with the school. In the initial stages of forming a relationship with your client, it is of the utmost importance that they are made to feel as though their needs are being prioritised. A ‘follow-up’ phone call to provide updates, and to remind the client of the school’s assets, is a small but enormously effective tool in eliminating any doubts about their importance to you. Whilst it may seem obvious, an often neglected but important step to remember when dealing with any new client is to ensure their contact information is collected. According to our sample, less than half of potential clients had their details taken at the first point of contact. Not only does this lack of foresight immediately cancel out any chance of a ‘follow-up’, the message sent to clients is one of unprofessionalism and disinterest. The significance of making a record of even a small enquiry cannot be overlooked, as the ‘follow-up’ that will stem from this record could be the key. Another step is to set an appropriate time for the ‘follow-up’ call with the prospective client where possible. This way, he or she immediately knows that they are being taken seriously, and that their child’s potential enrolment is important enough to the school to be pursued at a later date. Your school is in its most advantageous position to convince a client to enrol their child just after a tour of the school has been given. Tours of the establishment are proven to be an effective way of attracting business. This is why it is once again vital to ensure a ‘follow-up’ takes place in the small window of time between the visit ending and the client having the chance to explore alternatives. Your staff will have worked hard to create a vibrant impression of the offer on the tour but the longer the ‘follow-up’ is left, the duller the impression of the visit becomes.in your client’s mind. The advantages of your establishment, however strongly impressed, can be diluted by the indifference of the school afterwards; the hard work your team put in to gain a rapport with the client or child may well be undone. Establishing a clear time and date for a follow-up call with your client is a simple but extremely effective tool to use to prevent this from happening. Just by reaching out to remind the client of your interest in them, and to thank them for their visit, you could distinguish yourself as a more personalised, caring establishment than your competitors. Finally, the ‘follow-up’ call in itself should be representative of the high standards set by your school; your staff should understand the goal of the conversation – whether this is to answer any previous queries, to provide further information, or to schedule a visit to the school. Data from our sample shows that in only 33% of cases did the school follow up with the client within that ideal 3 – 5 day window prior to working with insight6. Moreover, none of our Researchers reported any enthusiasm whatsoever from the staff member they were speaking within the ‘follow-up’ call, and no indication that the school had been doing anything to resolve their concerns. A school’s reputation for professionalism is at risk in these small errors – as for example in not knowing the client’s name or being unable to recall previous conversations – and in this period, when a client is still forming their opinion of the school, you cannot afford oversights. The client is the priority, and needs to be treated as such by all of your team, including those that handle the customer service department. Following on from this, your staff should be aware that professional conduct extends to every possible outcome of a client enquiry, even if that is an eventual decision to abandon the pursuit if it is not right for them. Your customer service department is the voice of your school, and represents the way you handle all matters, including disappointment. Leaving a negative impression here is undoubtedly a reputational risk, which is easily avoided through appropriate staff training and guidance. Here at insight6, we are dedicated to identifying the weaker areas in your customer service department, but also to provide the tools with which to improve. Our thorough training and development sessions are a simple and effective way to teach your staff the importance of the ‘follow-up’, along with other strategies that will guarantee a more successful rate of attracting and keeping business. Our sessions are tailored to your school’s needs, and provide interesting, interactive, fun methods of helping your staff to reach their highest potential as customer experience providers. During these stringent economic times, it is not an option for your school to be anything less than airtight in all departments, so that clients showing interest cannot be left to slip through the cracks. Paying attention to the small but significant details, making your client feel cared for and important and offering a truly personalised service are sure-fire ways to distinguish yourself amongst the sea of indifference that our research suggests can flow from many establishments. The ‘follow-up’ is an easily implemented, inexpensive and incredibly effective tool; try making it front and centre stage of your business strategy and see where that takes you!